With great thanks to the Leukemia & Lymphoma Society of Canada, we know there are 100, 000 people living with or in remission from a blood cancer in Canada. Leukemia is still the most common form of paediatric cancer in Canada. Survival rates are improving, however, we still have much to do in the fight against blood cancers. What is unfortunately little known is a potential partner in recovery, far too often overlooked – Exercise. Exercise is far too minimized and under utilized as a vital partner in integrative oncology, and Lymphoma and other blood cancers are no exception. Please note when I say exercise — I mean the right exercise – exercise should not imply training for Iron Man or Triathlons, it should be viewed and revered for its therapeutic, restorative & rehabilitative wonders, right down to the cellular level. First a bit about exercise and cancer recovery in general…not particular to blood cancers. A lifestyle to prevent cancer is a lifestyle that protects us from all of our chronic illnesses, mental & physical, and it all starts with creating a hostile environment within destroying cells as they become cancerous. We need to create our “biochemical terrain” that is able to annihilate the inevitability of cells becoming cancerous because of a biochemical terrain that enables cancer to flourish. Oxidation: As we know from exercise science, our fitness, health is completely dependent on how efficiently we use oxygen. Yes we need oxygen to live however our health, protection from the degradation of aging, cancer prevention is all about keeping a balance within between oxidative stress (producing free radicals) and antioxidants, our best cancer prevention. Cells deprived of too much oxygen (estimated at 35%) can also morph into cancer cells – balance. Inflammation: Another key to cancer prevention (and heart disease, aging, immunity, depression……) is inflammation, we need tight control over inflammation. Leading causes: smoking, lack of sleep, lack of exercise, activation of stress hormones, alcohol, sugar, Omega 6 oils such as vegetable oils, trans fats…..Inflammation is a critical part of our body’s innate immunity – its attempt to heal itself, however, when it becomes a chronic condition, this “inflammatory state” the immune system attacks healthy tissue, mistaking them for harmful pathogens. Even if a cancer is removed, that is only the start on the road to remission and the celebration of “cancer free”. The biochemistry has to be to be able to attack and destroy any hidden cancer cells from multiplying, violating the patient once again, usually in a more toxic, vengeful form. The right exercise, in the right amount, can help regulate all of these biochemical markers. Glycemia: Let us all count the ways……but really our muscle mass is the real hero here. ..taking sugar out of the blood stream into the muscle…..just as strength training is a diabetics best friend. Sugar feeds cancer. Exercise reduces Insulin resistance, lowering levels of blood insulin, a growth factor, discussed further below. Inflammation: Again our muscle mass is key here to control the inflammatory chemicals secreted by cancer cells. A sedentary lifestyle allows protein loss from body tissues. Inflammatory responses are like wildfire without exercising the muscles, leading to muscle wasting and destruction of the immune system. Cachexia is an unfortunate side effect of many cancer treatments, exercise is the best retaliatory defense. Oxidative stress: Now here we do have to be very careful of balance, slow and steady wins this race. The right type and dosage of exercise produces enzymes that reduces free radicals. However, too much exercise can produce free radicals. Immune support is tricky with blood cancers. According to Dr. Keith Block, of the Block Center for Integrative Cancer treatment, immune stimulating supplement are a NO, as I have heard from every oncologist, but immune support to fight immune suppression, fatigue …is necessary. This again is why the RIGHT exercise is necessary, because the wrong exercise can lead to excess free radicals, inflammation & depressed immune function. Slow and steady is the very best advice here. The benefits of exercise are still necessary. Controlled physical activity can help people minimize the worse immune offenders being: smoke,alcohol, emotional stress, sugar consumption. Physical activity helps with NK (natural Killer) cell performance & T cell function. Heeding to blood counts – your doctor will advise you on the status of blood counts, red blood cells, minerals……. Appreciate the circulatory & relaxation & restorative side of exercises, flexibility, Range of motion, the best support. Unfortunately I have found that many people with blood cancers have a certain need to punish & repent – why did I not eat right and exercise before, why did I smoke……..however, during treatment is NOT the time to over compensate. I personally find the toughest part of my job working with people with blood cancers is trying to keep them at the right pace, when often they want to go into overdrive and push much too hard. According to Dr. Kerry Courneya, Canada Research Chair in Physical Activity and Cancer, University of Alberta, in a study of multiple myeloma, the most challenging physical activity wise of all the blood cancers, survivors who report exercise during and after treatment also report higher quality of life. Knowing how to work and analyze the needs of each individual client is of the utmost importance from the health/fitness professional. Blood cancers demand a very delicate balance for the necessity of physical activity throughout its powers of immune support, circulatory support, breathing & relaxation, supporting good sleep….but not overdoing it causing any immune stress, or stress on the blood cells. And the most overlooked aspect of exercise….smile time. Again we are clouded by visions of exercise being about pain, misery, another cumbersome, dreaded thing in our life. A very cruel, inaccurate prejudice. The right exercise professional will design physical activity around other lifestyle demands, and show the person that exercise time is smile time, and puts us in our happy place physiologically, unlike anything else. Truthfully, my favourite thing for clients to say to me is “I hate exercise”. That is an irresistible beckoning to show someone a new self love, open up an inner Genie in a bottle of pleasure, yes for people dealing with cancer as well. The trained exercise professional knows how to make physical activity a form of laughter therapy. As the person starts to reap the physiological & psychological rewards, the feeling of taking control, not being helpless in their recovery, is empowering and encouraging. This sense of optimism encourages the person to adopt other healthy lifestyle habits. I call is neurotransmitter nirvana. 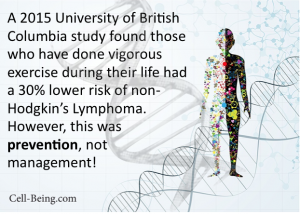 More studies are currently underway on Lymphoma and exercise. It is well known that treatment for childhood lymphoma is associated with a very high rate of cardio vascular disease. 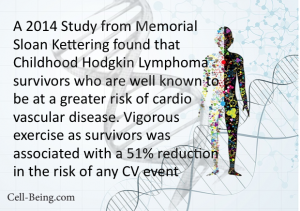 A Sloan Kettering 2014 study that vigorous exercise in Hodgkins Lymphoma survivors can reduce their risk of CV events by 51%. Again, please note there is a vast difference of exercise during treatment for Lymphoma vs. as a survivor! And the truth is we often don’t know why exercise is so magical – we just know it is and it works.